Federal Agents Board Buses 100 Miles From Border To Ask, Are You A U.S. Citizen? U.S. Border Patrol agents are boarding buses and stopping cars from private lines like Greyhound and Concord Coach within 100 miles of a U.S. border, asking passengers if they're American citizens. A U.S. Border Patrol agent stands at a highway checkpoint on August 1 in West Enfield, Maine. Here's what happens, according to Dennis Harmon, division chief for the Border Patrol Houlton sector in Maine. Border Patrol agents set up immigration checkpoints on highways within 100 miles of a U.S. border. They stop every vehicle traveling on the road, and ask each person if they are a U.S. citizen. If the person replies, 'Yes,' they are a citizen, in most cases, they are free to go. "If they are a citizen of the United States, there is no law or regulation that requires them to carry identification saying they're a citizen," Harmon tells Here & Now's Peter O'Dowd. "That simple verbal declaration of 'I was born in Lewiston, Maine, or Sioux Falls,' and that proves they're a United States citizen." But it's up to the discretion of the officer to believe that the person is really a citizen. While U.S. citizens do not have to show officers documentation to prove they are a citizen, Harmon says non-U.S. citizens who have legal status are required by law to carry their papers. This discretion is raising questions among civil rights advocates about whether racial profiling is at play. Border Patrol says these checkpoints are nothing new. While the actual number is unknown, the American Civil Liberties Union says, according to news reports, that the federal government operates almost 170 checkpoints within the border zone. But Border Patrol sometimes gets it wrong. In 2012, the New York legal aid group Families for Freedom successfully sued for records that showed at a bus station in Rochester, Border Patrol agents mistakenly arrested 300 people with legal status over the course of four years. The ACLU has filed Freedom of Information Act lawsuits in Michigan, Southern California and Arizona hoping to force Border Patrol to turn over records of how often people are wrongfully detained at immigration checkpoints, says Thomas Dresslar, an ACLU spokesperson. 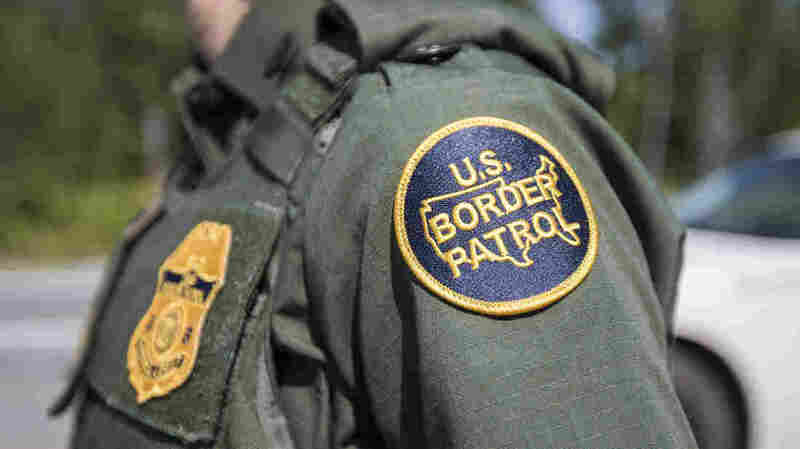 Customs and Border Protection, which oversees U.S. Border Patrol, declined to comment on the pending lawsuits. Not only is racial profiling at play, but the ACLU contends that Border Patrol agents are violating the Fourth Amendment, which protects Americans from unreasonable searches and seizures. In May, the ACLU won a lawsuit against Border Patrol earlier this year after it used an immigration checkpoint in New Hampshire to search cars for illegal drugs. "The Fourth Amendment does apply in the so-called 100-mile zone," says Emma Bond, a staff attorney with the ACLU in Maine. "[Customs and Border Protection] does claim that within this 100-miles that they can stop anyone without a warrant, without probable cause, without reasonable suspicion. And yet, all of those things are the hallmark of Fourth Amendment protections." Civil rights and immigration advocates also say that the 100-mile zone is too large. According to the ACLU, nearly two-thirds of the U.S. population live within the 100-mile zone, due to the location of many major cities along the coasts. This means that if you live in Connecticut, Delaware, Florida, Hawaii, Maine, Massachusetts, New Hampshire, New Jersey, New York, Rhode Island or Vermont, you are completely or almost entirely within the zone and can be subject to Border Patrol immigration checkpoints. If you do come face-to-face with an officer, Bond says you can invoke your right to remain silent and say you do not consent to a search. You can also use your smartphone or other device to record the interaction as long as you don't interfere with the officer, she says. "It really is a question of what kind of society we want to live in," she says. "Well, I don't want to live in a society where I could be stopped by an armed law enforcement officer when I'm boarding a bus, when I'm going to the grocery store, when I'm going to work. And yet that's what [Customs and Border Protection] claims that they can do."